Orb Audio has been making unique-looking, spherical speakers since 2003. Orb sells its products exclusively online with a 30-day, no hassle, in-home trial. 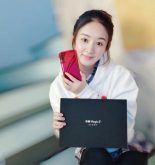 People must like what they hear because the company claims it gets less than one percent of its shipments back. Orb Audio’s Complete Home Theater offering is a $999, 5.1-channel system aimed at people who care more about music and movie soundtrack quality than getting all the most recent audio bells and whistles. Orb’s package is also a testament to the company’s drive to make its speakers domestically tolerable. In other words, their diminutive size (you can hold them in the palm of your hand), mounting, and color/finish options enable them to blend into most décors. The Orb Audio Complete Home Theater packs five of the company’s Regular Mod1X speakers in your choice of white or metallic-black gloss finishes; Orb Audio’s subMINI Ultra Compact subwoofer; a high-quality subwoofer cable, 100 feet of speaker wire, and a Denon AVR-S510BT 5.1-channel A/V receiver. 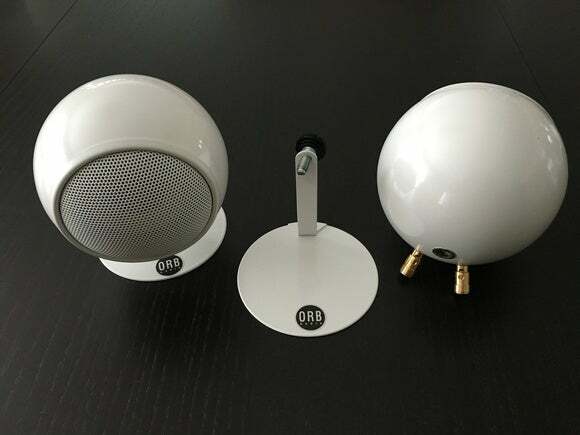 Orb’s spherical satellite speakers are a departure from the typical box; the subwoofer is not. Orb’s system approaches surround sound in textbook fashion: Each speaker is exactly the same speaker model, so they’re tonally balanced. This truly ensures that each speaker will sound the same and that the timbre across your entire sound field will match perfectly. 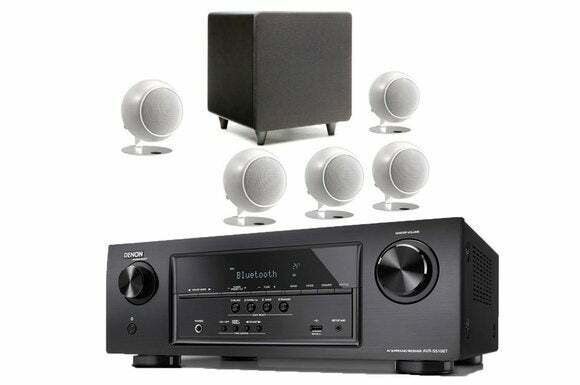 This package emphasizes speakers over electronics. 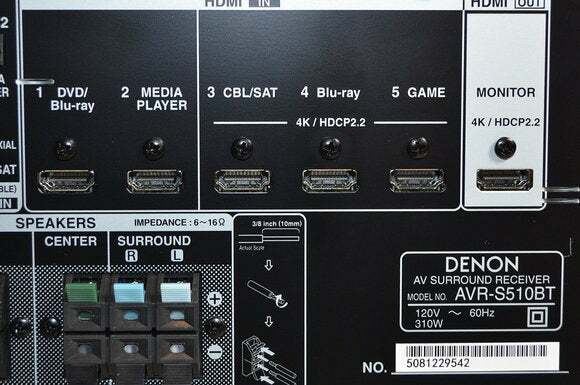 The included Denon AVR-S510BT (available separately for $279) is an entry-level model with five HDMI inputs, three of which (along with the one HDMI out) are certified to support 4K UHD video with HDCP 2.2 copy protection. The Denon’s network and streaming features are bit disappointing. The receiver supports Denon’s own HEOS Link multi-room audio technology, you can stream music from a mobile device using Bluetooth, or connect a digital media player to its front-panel USB port. But there’s no ethernet or Wi-Fi support, no Apple AirPlay, and no Spotify or other subscription music-streaming services. The bundled Denon AVR-S510BT is a somewhat plain-Jane model, apart from its support for Denon’s HEOS multi-room audio and its three 4K UHD/HDCP 2.2 HDMI inputs. Orb’s speakers measure just 4 and 3/16 inches in diameter, but they weigh about 20 ounces each. The carbon-steel enclosures house a three-inch, full-range aluminum/magnesium driver with a custom voice coil and a neodymium magnet. A standard 1/4-inch thread-mount on the back provides lots of placement flexibility (you can mount them to your walls or ceilings, to an entertainment center, or what have you). Orb’s subMINI is as tiny its name implies, but boasts frequency response down to 32Hz, thanks to the sub’s dual-port design. That’s quite respectable for a 6.0-inch driver. You just won’t get the full impact from the depth charges in the movie U-571. On the other hand, the Denon receiver is the only one in this roundup that’s capable of driving two self-powered woofers that you could place in different areas of your room. One feature that sets Orb’s system apart from the competition is the option to upgrade to a speaker array by connecting additional speakers to each channel. Orb says this will deliver fuller high- and mid-range frequencies because the drivers will work together as a single source to increase sound pressure levels to the listener. 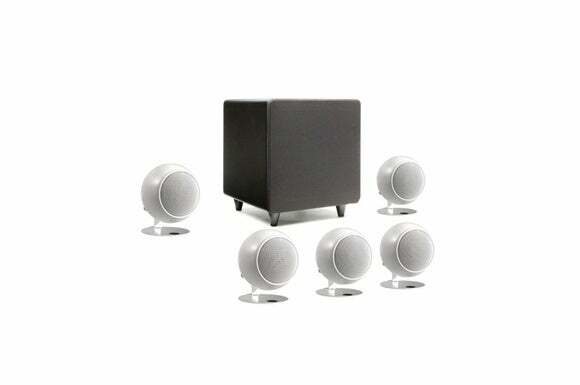 An Orb Mod2X upgrade consists of two speakers per channel, while a Mod4X upgrade consists of four speakers per channel. An Orb spokesperson tells us there’s no need to worry that the resulting reduction in impedance presented to the amp will damage the receiver. These optional upgrade kits include stands to accommodate multiple speakers and jumper wires that clip the two speakers together and connect the two sets of binding posts. You can also order the speakers with upgraded finishes, at additional cost: Hammered Earth is a $75 upcharge, while the steel, copper, and bronze finishes tack on an extra $150. If you’re looking to match a particular look in your room, Orb has you covered. 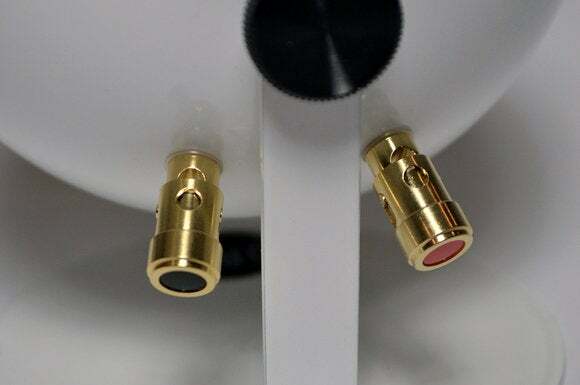 Orb Audio’s all-white cables are easier to hide than most, but pay attention to which color wire you’re connecting to the positive and negative terminals on the speakers and the receiver. Orb Audio’s system was easy to set up, but it requires some attention and you’ll need a good pair of wire strippers because the speaker cables are thicker and of better quality than you might expect of an entry-level system. Once you strip the white insulated jacket from the ends of the cables, you’ll see that one wire is copper and the other is silver in color. 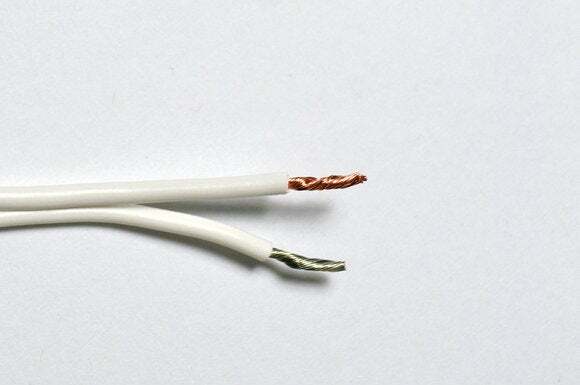 There’s no functional difference between the two wires, but if you connect one end of the copper-colored wire to the positive terminals on the speakers, make sure you also connect the copper-colored wire at the other end to the positive terminals on the receiver. Orb’s wiring solution is less fool-proof than what some of the other manufacturers provide, but it’s all-white color will probably be easier for you to hide. With my speakers set up, I followed Orb Audio’s included instructions and set the volume on the subwoofer to the half-way mark. I then plugged in the included calibration microphone and let the Denon’s room-correction solution do its magic. Calibration went without a hitch and after several minutes I was ready to rock. Orb Audio’s speakers have the best binding posts of the models reviewed for this roundup. I kicked things off with the Star Wars: The Force Awakens soundtrack. From the first notes I played, I was immediately taken by the good sense of space, depth, instrument separation, and neutral presentation. The speakers almost disappeared. Brass instruments on the track “Main Title and The Attack on the Jakku Village” were well rendered, with nice overall extension. Strings were delicately presented, and the system’s timbre sounded natural with little coloration. The Orb setup presented just about every instrument well, with the notable exception of percussion. Drums didn’t have their authoritative weight or commanding presence. In fact, bass notes consistently suffered in my room. I ultimately attributed this to the small size of the sub given the overall size of my room. To make sure I wasn’t missing anything, I even moved the sub around and re-ran Denon’s room correction to make sure that the issue wasn’t anomalous sub placement or bad calibration. That didn’t make a major difference. Youcould add a second sub, but if you want really deep bass, you’ll probably just want a more powerful one. The top end of the percussion range was respectable, but lacked sizzle. In Loreena McKennitt’s live album, From Istanbul to Athens, for example, there’s a cymbal strike about 1:08 into the opening track, “The Gates of Istanbul.” The characteristic sparkle, detailed decay, and real-life presence that you get on more-expensive speaker systems just wasn’t there with the Orb system. Remove the stands and you can mount Orb’s speakers to wall- or ceiling-mount hardware. I threw in Mad Max: Fury Road on Blu-ray to see how the Orb Audio system would fare. It was an intense sensation from the start. The individual channels bonded together to form a seamless sound field—just as you’d expect using perfectly matched speakers. The Orb system masterfully reproduced the opening scene with Max’s center-channel soliloquy flanked by haunting voices that danced around my head. Voices were consistently crystal clear, and I never had any problems understanding dialog. As good as the Orb Audio experience was, I much preferred the experience that the Dolby Atmos-enabled Onkyo HT-S7700 HTIB delivered. Even though the Orb speakers sounded more natural and less colored, the Onkyo delivered a bigger and more impactful audio experience. Orb’s speaker upgrades might help here, but you won’t be able to add Dolby Atmos without also upgrading the receiver. All in all, whether it was music or movies, the Orb Audio Complete Home Theater system impressed in its overall timbre, ability to resolve details, and render dynamics. The only underwhelming part of the experience was absence of a deep low end. Orb Audio’s Complete Home Theater is a great-sounding, high-performance system for those who want optimal music and surround-sound reproduction from an all-in-one system. Orb’s a la carte upgrade options—at check-out or down the road—provide for a flexible system that can grow with your needs.